The early morning mist swirled around the lush green mountain tops, illuminated by ethereal rays of sunshine as they burst through gaps in the earthbound clouds. 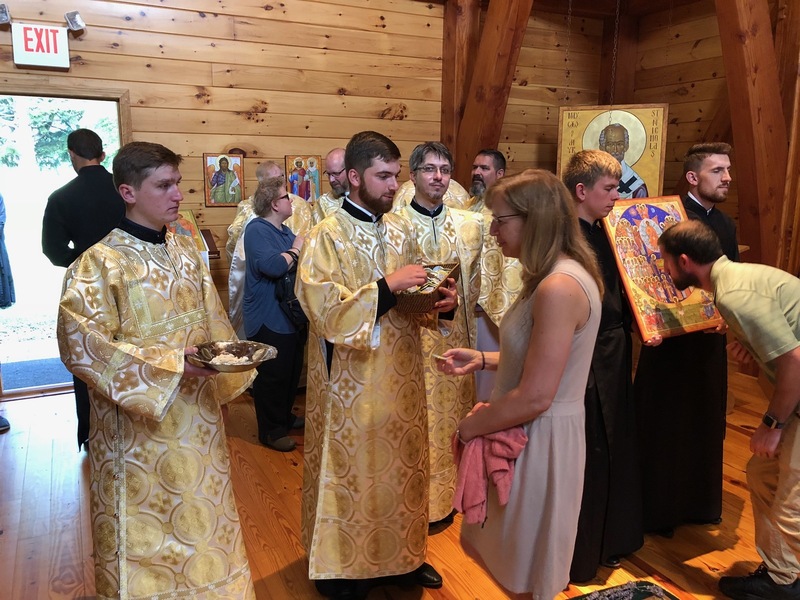 Mesmerized by the otherworldly beauty the faithful who were traveling to attend the Centennial Celebration of the Ukrainian Orthodox Church of the USA at All Saints Camp in Emlenton, Pennsylvania, slowly wound their way through the hilltops, making one final turn onto a country road to begin a slow descent into a hidden valley nestled in the crook of a luxurious green mountain, which rose along the majestic Allegheny River. 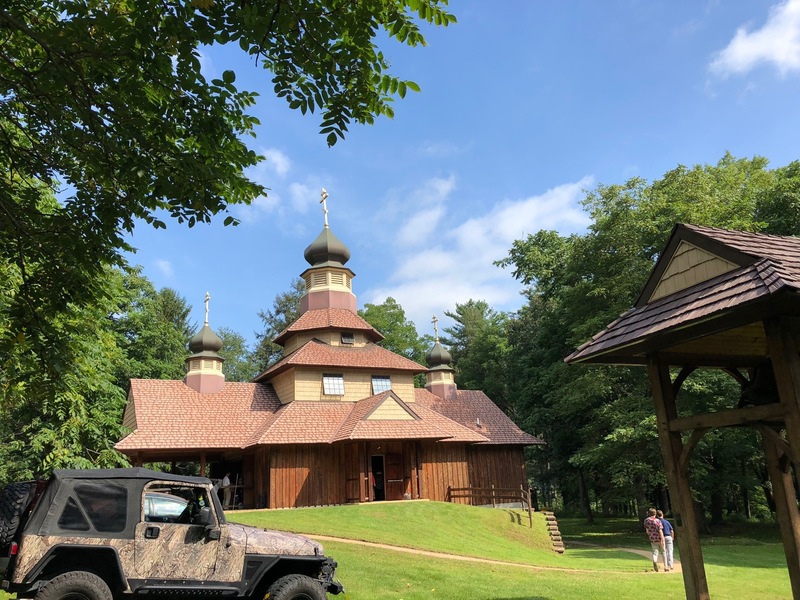 At the bottom of the basin one final turn, and they enter the grounds of All Saints Camp and were immediately awestruck by the beauty of the St. Thomas Chapel, constructed in the style of traditional wooden churches found all over the Carpathian Mountain regions of Ukraine. 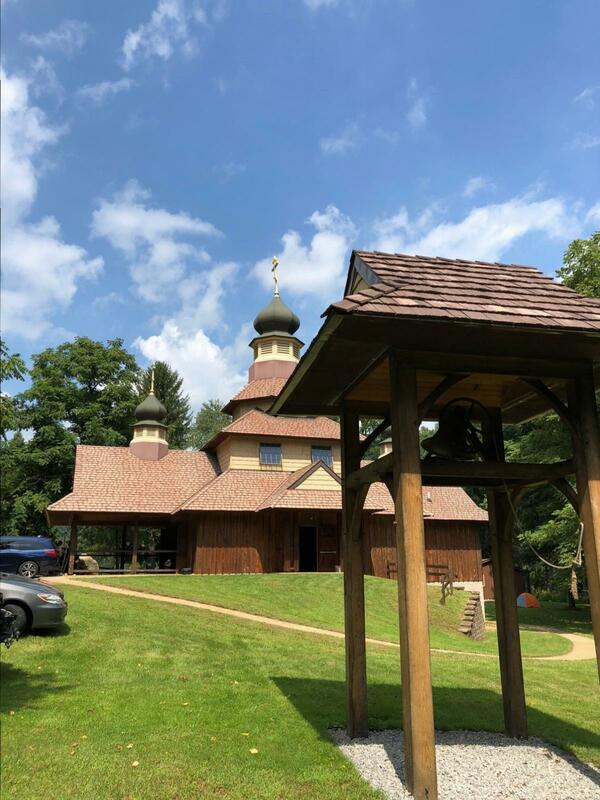 Consecrated in 2008, the church was erected on the campgrounds to allow the youth, who attend the various Church Camping Programs, to be able to worship the Lord and learn about their Faith, in a beautiful and inspiring temple. 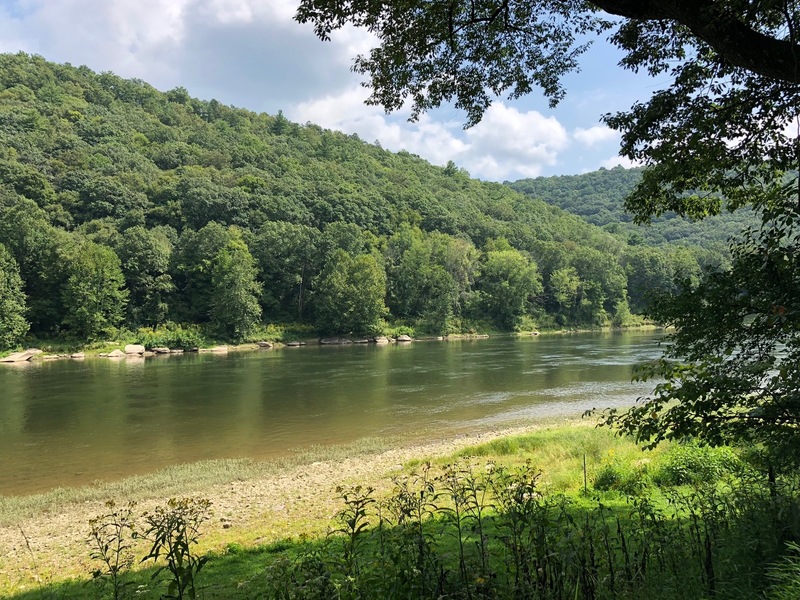 This morning, as the birdsong echoed through the mist, bouncing off the mountainsides, their voices were accentuated by the sweet voices of humanity, who joined them in praising the Lord on such a lovely day. The chapel doors stood wide open, as the worshippers filled the cavernous nave and overflowed to the outdoors. 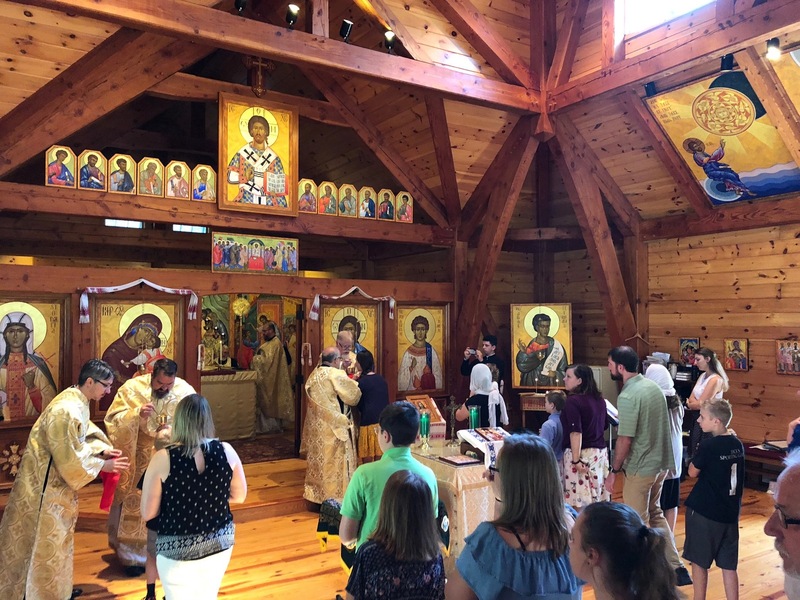 Approaching the chapel, one was hit by the fact that the Divine Liturgy was being served not only for those inside, but, encompassed the entire world. The site of congregants standing outside beneath the gentle blue sky, facing the altar, crossing themselves, bowing, and singing along, was poignant, as today, in truth, the service had overflowed the confines of a physical structure and overflowed out in to the world beyond, encompassing nature, and pulling it in to participate in the celebration and worship of the Lord. 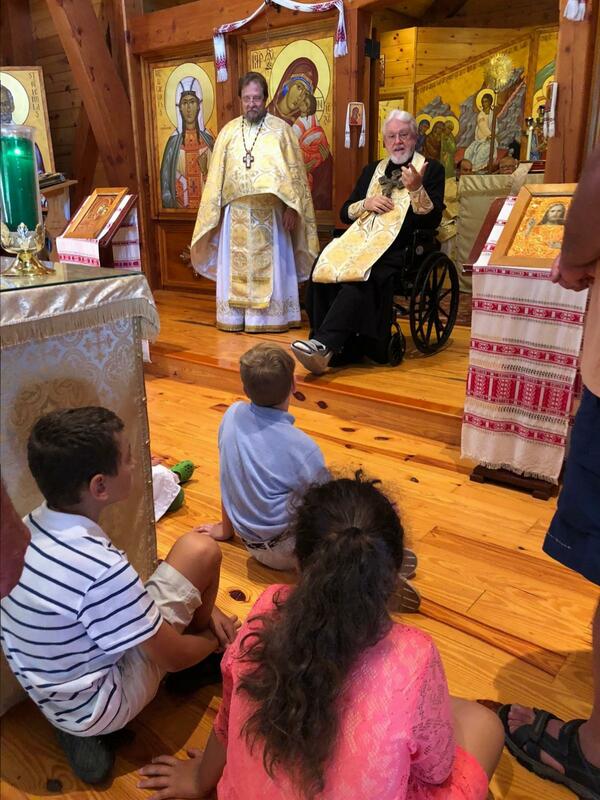 Inside the cavernous nave of the chapel, the faithful prayed, overjoyed to be joined by His Eminence Metropolitan Antony, who was recovering from his recent automobile accident. 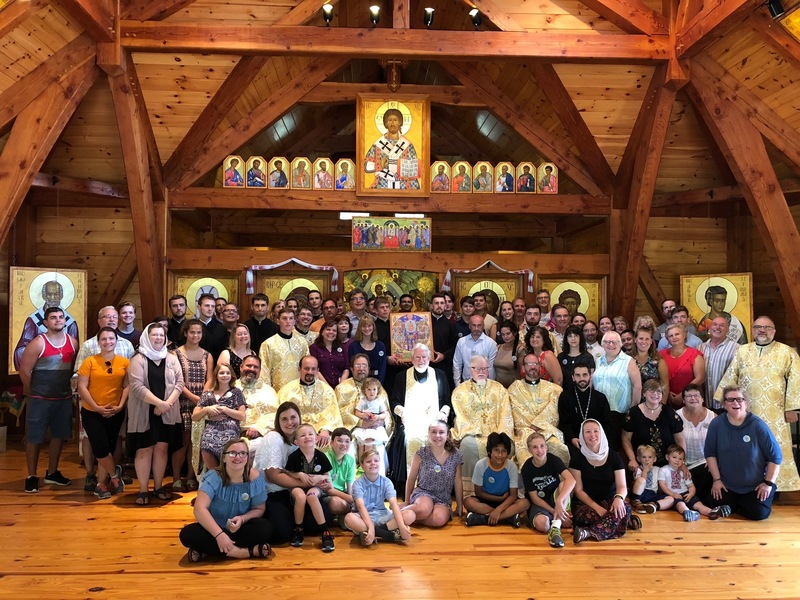 His Eminence was joined by many priests who had arrived from near and far to celebrate not only the Centennial of the Ukrainian Orthodox Church of the USA, but also the 40th Anniversary of All Saints Camp, and the 10th Anniversary of the consecration of the St. Thomas Chapel in which they now stood and worshipped. 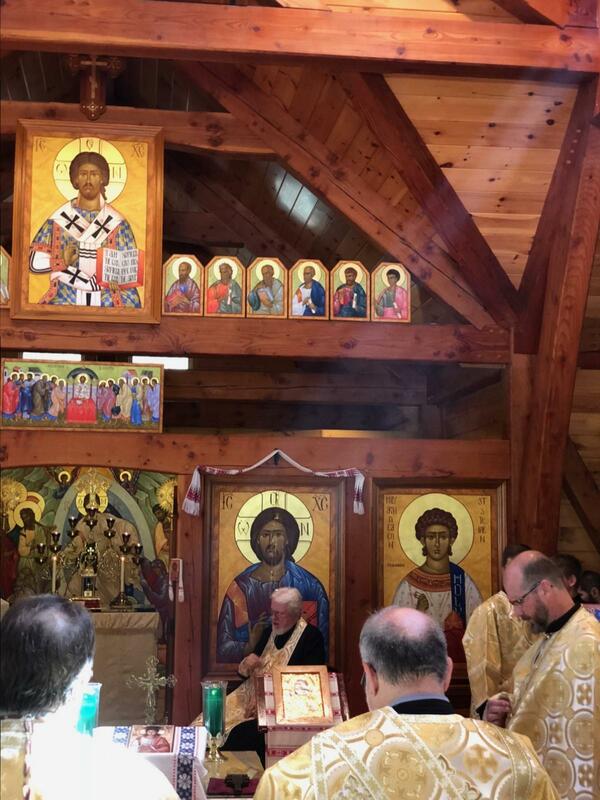 While not physically with them, His Eminence Archbishop Daniel was present in the thoughts, hearts, and prayers of those gathered, as they prayed for his success, as he attended the Synaxis of Hierarchs taking place in Constantinople (Istanbul) at the Ecumenical Patriarchate. 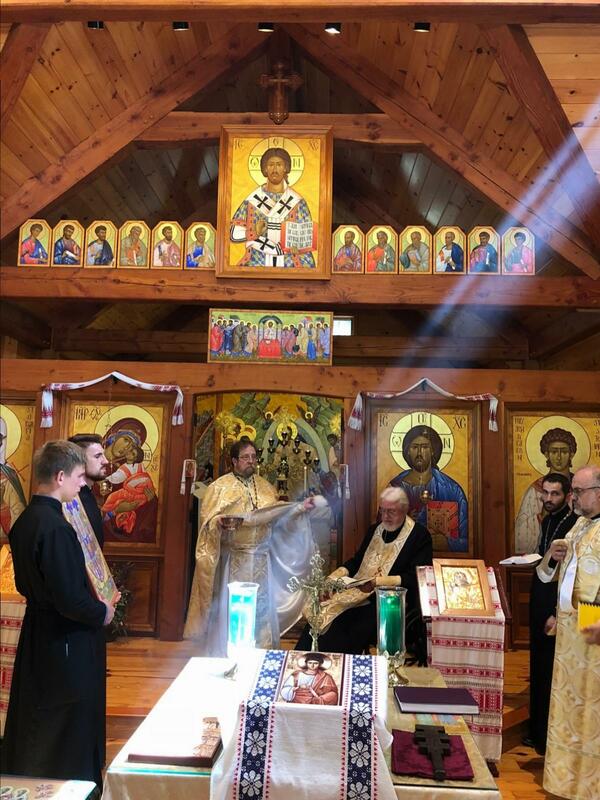 As the Liturgy ebbed and flowed, prayers raised to the Lord were accentuated by the smoke from the incense as it flowed from the altar, swirled around the faithful, and traveled up to the dome of the church, to catch the rays of the sun, and surreally accentuate the divine. 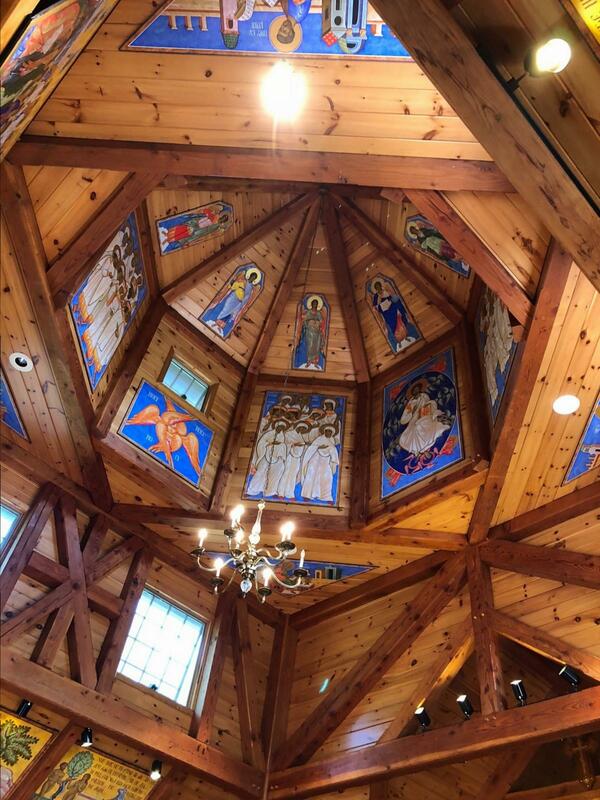 The rays of light drew people’s eyes upward where they paused to gaze upon the icons in the dome of Christ, the angels, and saints who were soberly gazing down upon the faithful gathered below. 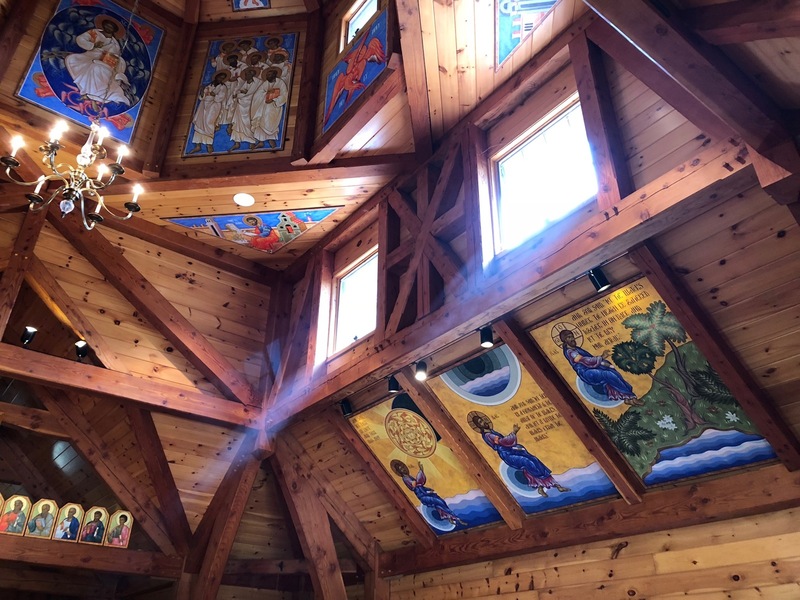 Standing inside the wooden structure of the church, one almost felt as if they were standing within Noah’s Ark, itself, as it sailed across turbulent waters to safe harbor. 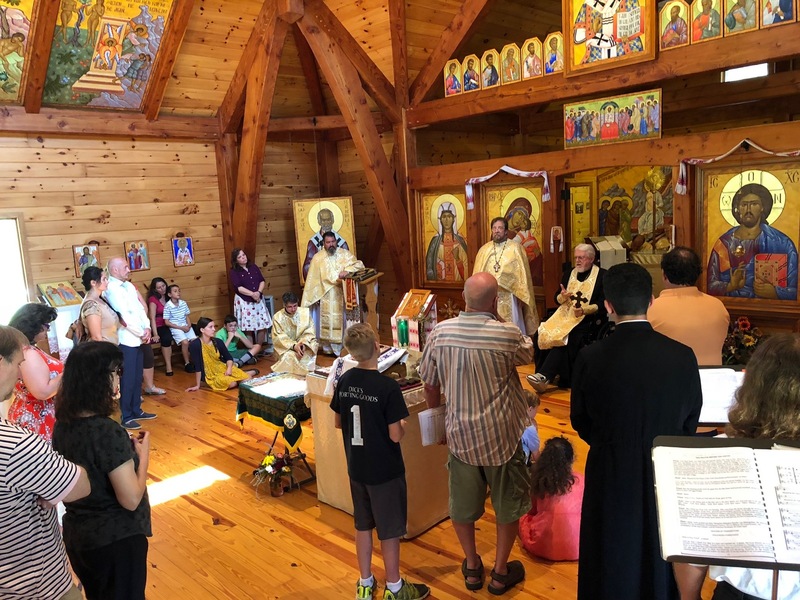 At the conclusion of the Divine Liturgy, His Eminence Metropolitan Antony took a moment to greet the faithful and to say a few words concerning the day’s celebration. 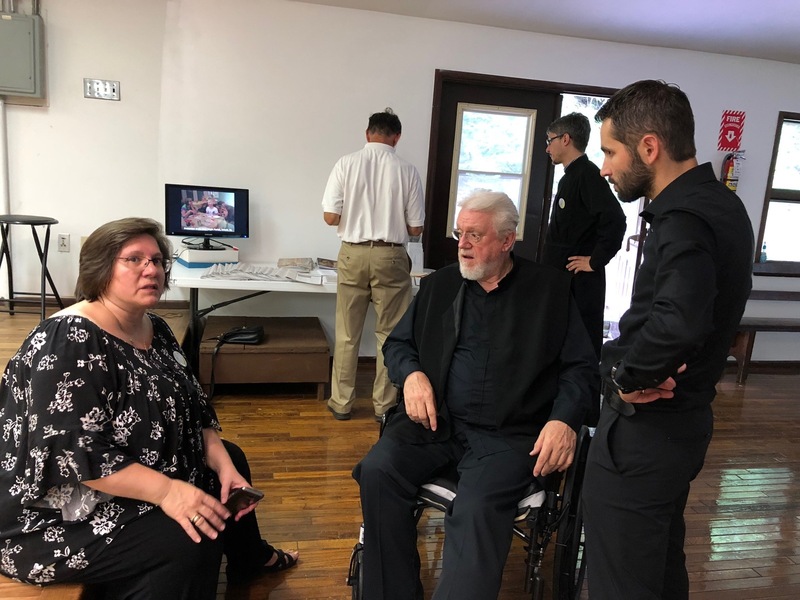 His Eminence explained that this day we were present at the second of four events that would take place this year as the Church celebrated its Centennial, the next taking place in Los Angeles in September, and the final one in Chicago in October. He asked that we take a moment to ponder what the celebration truly signifies. We should realize the hard work and dedication that previous generations had extended so that we could gather this day to celebrate. 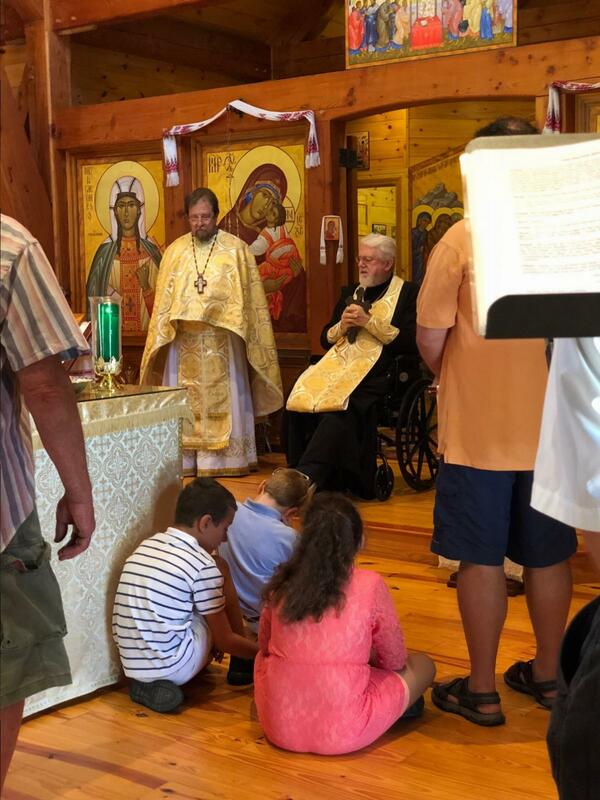 He reminded everyone how our ancestors had fled persecution, and arrived in a new Land, and the first thing they did was begin to build churches in which their children could freely worship and pray. The parishes they built were the focal points of their lives, as more and more families arrived and settled in cities and towns nearby. 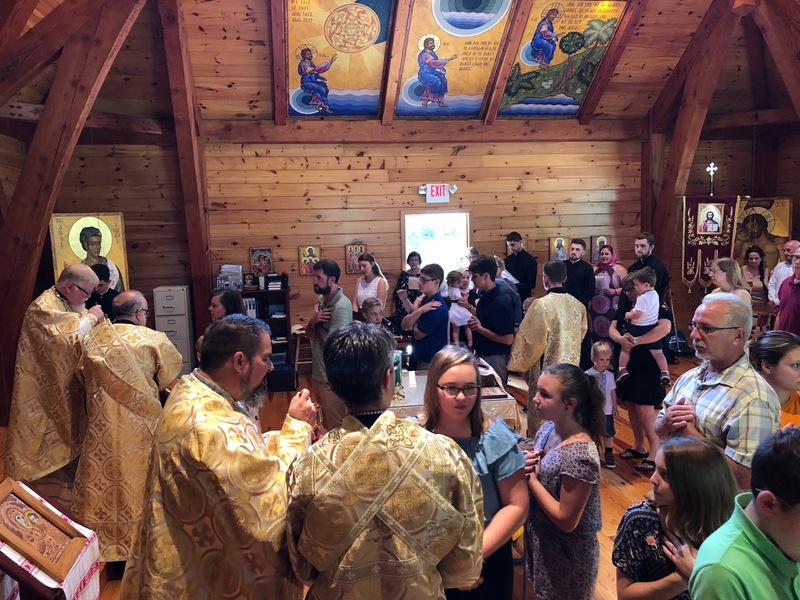 The parish became the heart of each local community, providing not only a place to worship on Sundays, but, was alive each and every day of the week. 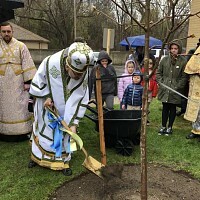 The parish communities thrived, church schools overflowed with hundreds of children, sisterhoods and brotherhoods were created, dance classes were held, youth groups organized, as the parishes strengthened and supported the faithful in all aspects of life, bringing them together to pray, and to play. 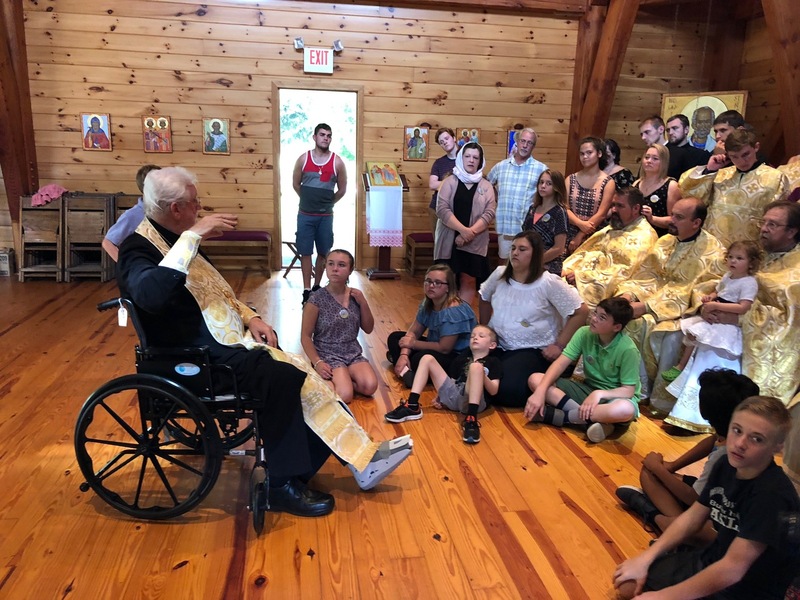 His Eminence noted that beginning in the 1970s life at our parishes began to change, as people began to drift away. Many left in search of work as local economies began to falter, while others simply drifted away enticed by the transient riches of this world. 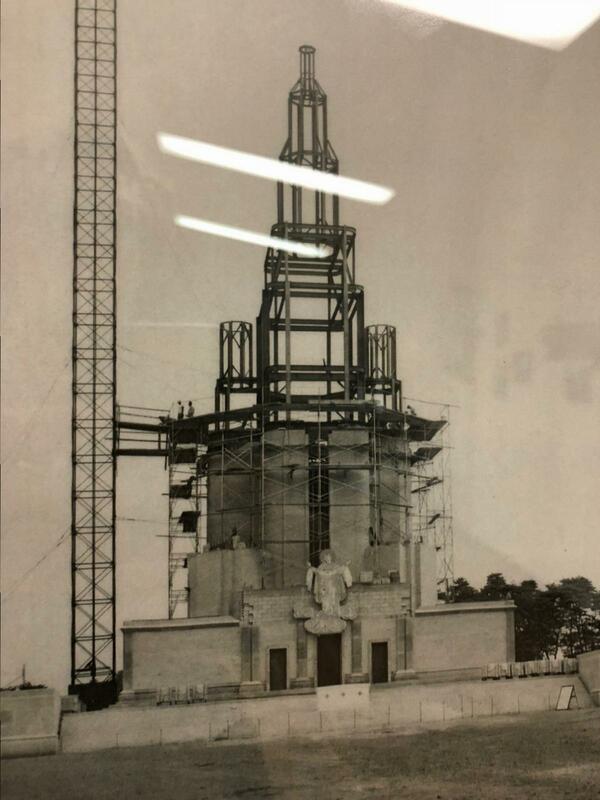 Today, as we celebrate 100 years, we also begin the second century of this Church. 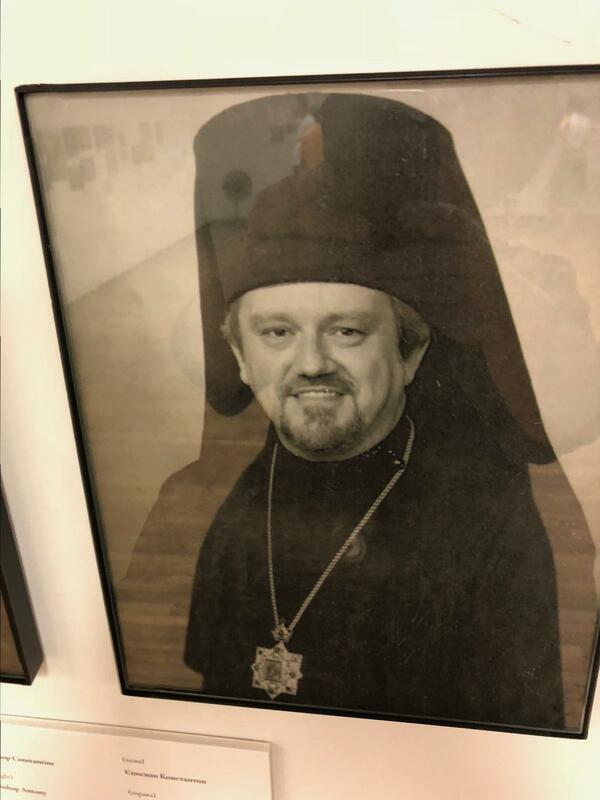 His Eminence explained that the ball is now in our court. We are not here to merely smile, party and enjoy an event; we are here to continue the work that was started a century ago. Vladyka explained that we are now the caretakers of this vineyard. Reiterating the stress under which society finds itself today, we are tasked with a great job, which we cannot turn our backs on. While the world population has soared in numbers, individuals are lonelier than ever. Depression is running rampant in today’s society, sadly increasing the number of suicides each year. It is our solemn duty to help those individuals, whomever they may be. 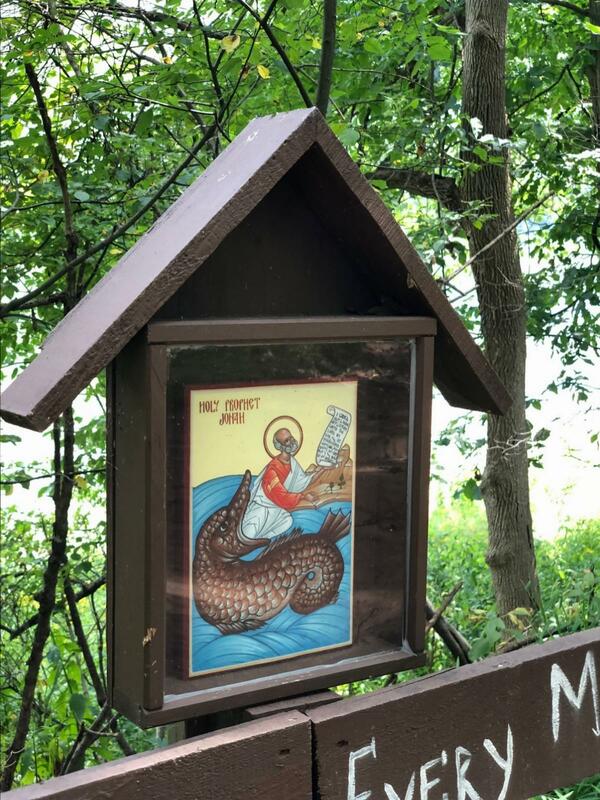 Vladyka instructed us that we, as baptized Orthodox Christians, cannot put ourselves and our personal comforts before those of others. We are not allowed to segregate ourselves and live as hermits, but, we are to extend ourselves, go amongst the people, reach out, touch, impact, support and pray for each other. His Eminence succinctly retold the parable of the king who had prepared a wedding feast and invited his friends and neighbors to attend. However, they all had excuses why they were busy and could not make it. Even though they were invited numerous times, each had a reason they thought valid, and chose not to attend, some even aggressively killing the messengers sent to invite them. At that point the king, frustrated with his friends, told his servants to go out on the streets and invite anyone and everyone whom they met along the way, and soon the banquet hall overflowed with guests. However, among these guests was one man who was not suitably dressed, and not wearing proper wedding attire. The king spotted him and directed his servants to take this man and throw him outside where there was “weeping and gnashing of teeth” (Matthew 22). While at first glance this seems a bit harsh, as the guest was simply invited at the last moment off the street and perhaps did not have a nicer outfit. 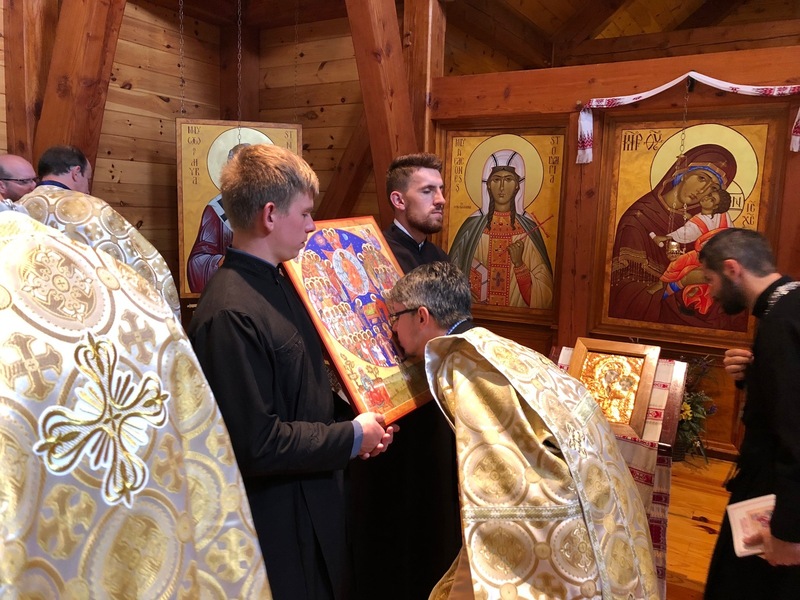 However, Vladyka continued by explaining that in those days, the king provided wedding attire to all who came to the feast – from his richest guests to his poorest, all were given new clothing to put on as they entered the premises. Therefore, having been given new clothes, why was this man not properly attired? Because he chose not to be. He refused to put on the beautiful new robes he was handed. He made the choice, and he had to deal with the consequences. Each of us is handed those beautiful robes at our baptisms. It is upon us to keep them white and unsoiled. We do this not by simply taking care of ourselves, but, by putting aside “ourselves” and our interests, and extending ourselves to help those around us. The need is great. People are suffering. 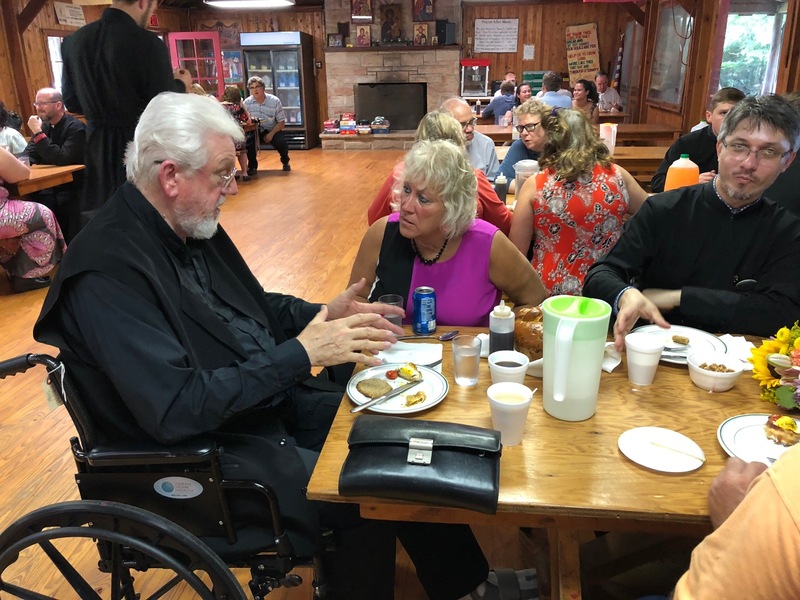 His Eminence continued by explaining that the depression people suffer these days is because nobody reaches out to them. They feel invisible to the world. They feel as if nobody would even notice if they simply disappeared off the face of the Earth. It is our solemn duty to not allow this to happen – to anyone. 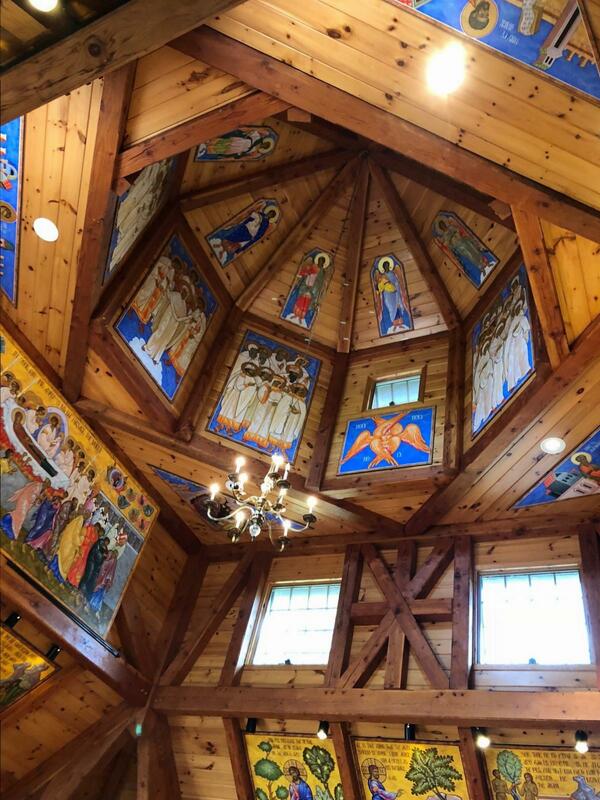 Vladyka told us we are to look up, look in to people’s eyes, acknowledge their presence, validate their beings. We are to stop, and ensure that the people around us, and not just our friends, but, all people around us, know that we “see” them, and we care about them. They are not invisible, and they matter – to the Lord, and to us. 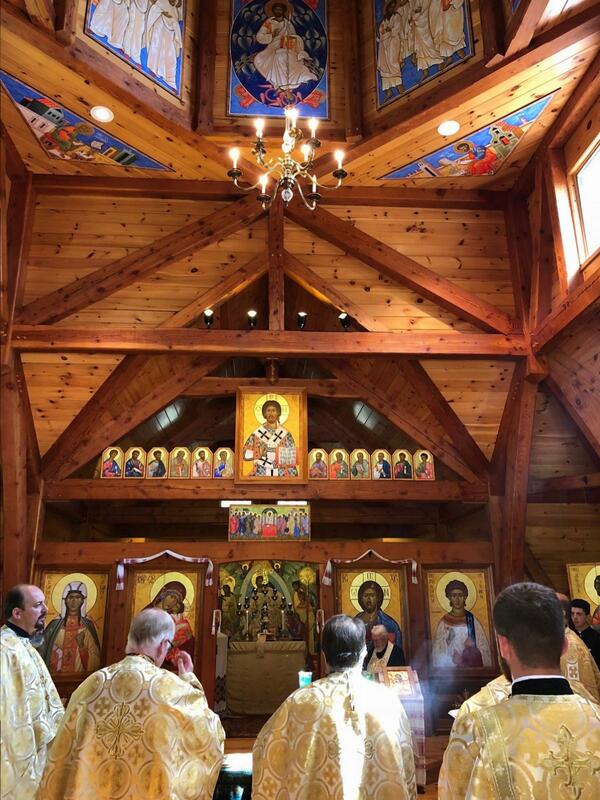 If we do this, and we must, then our Church will prosper and the faithful will gather again in one hundred years to celebrate the second century. 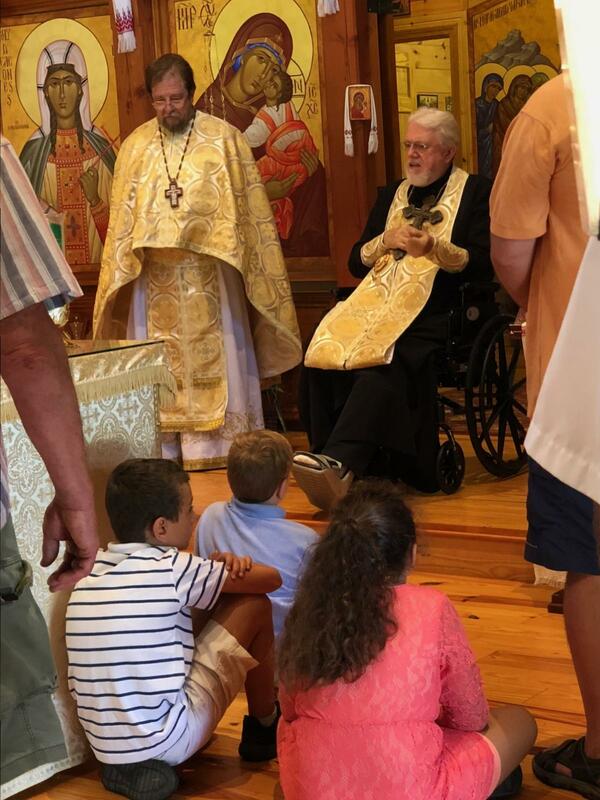 His Eminence explained and reiterated how difficult it must have been for our ancestors as they arrived in America. They were scared, families were broken, they mourned those whom they had to leave behind, and even more those who had been ripped from them through Soviet persecution and merely disappeared from their lives. 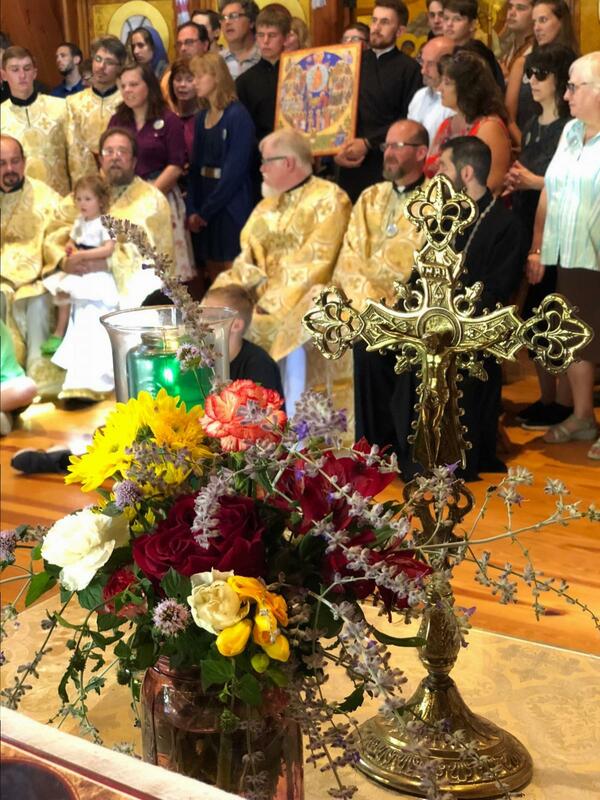 They came and they not only learned, but, mastered a new language, established communities, built churches and schools, worked numerous jobs, and still found time to participate in parish events, support each other and build the Church which we celebrate today. 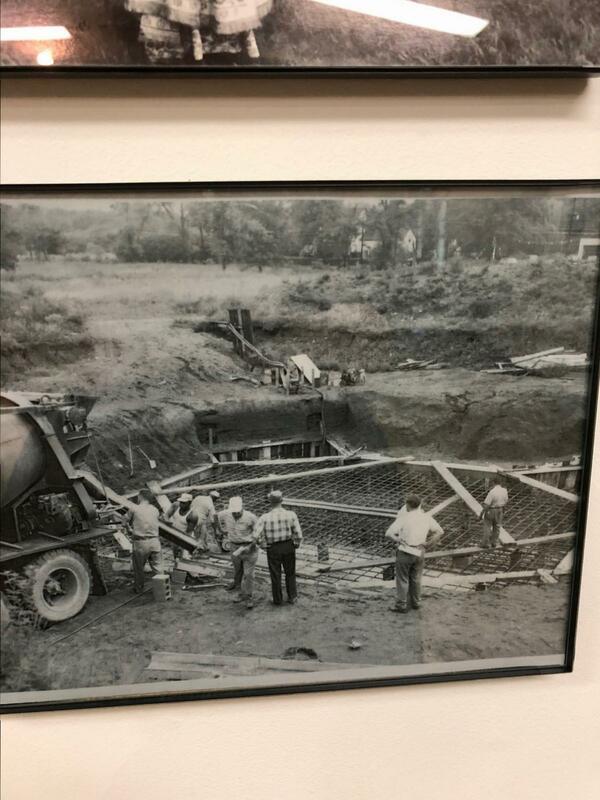 What will we do to keep their efforts and memories alive? What are we willing to do? We are on the doorstep to the banquet hall and the new robes are upon us. Will we enter or will we choose to remain outside? It is now up to us to revitalize our parishes. To build them up. To once again offer “services” that our faithful yearn for. 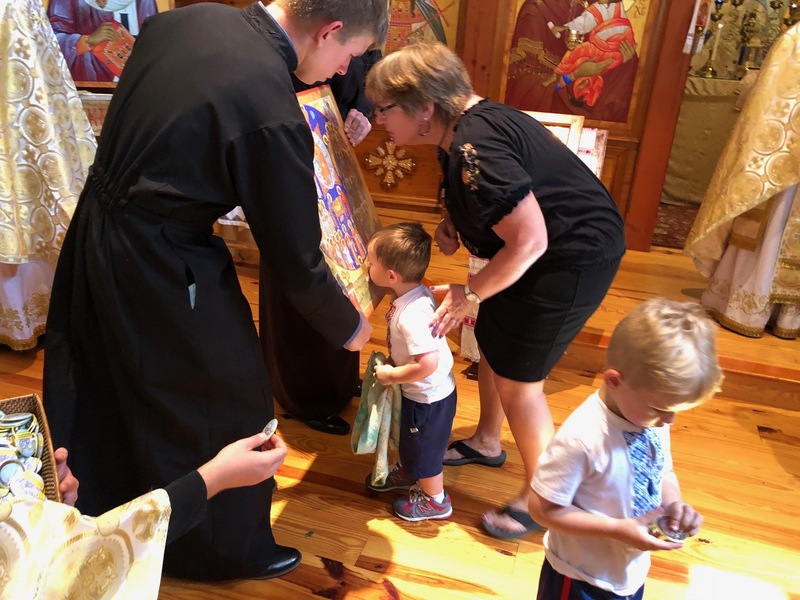 It is time to reinstitute our organizations, to offer education, companionship and foster familial bonds among all our parishioners. 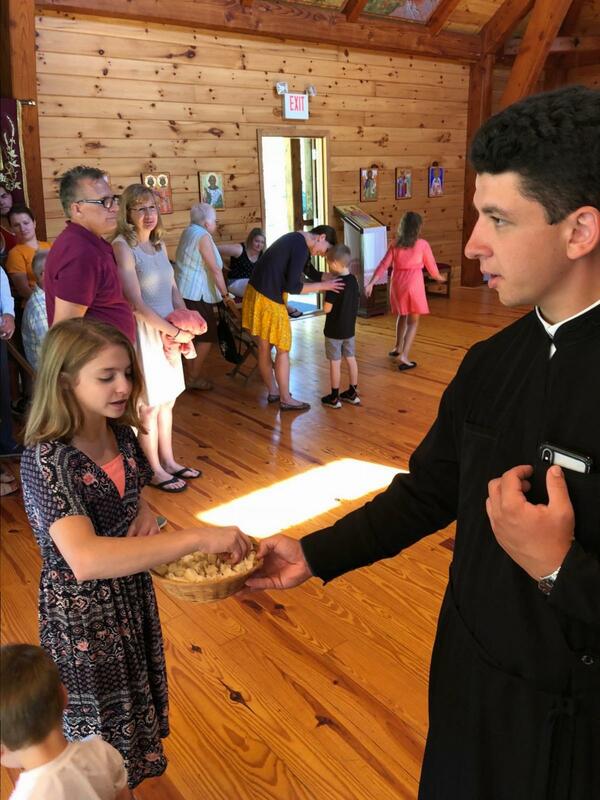 Our priests must serve Divine Liturgy not only on Sundays, but, on every Church Feast Day, whether or not anyone attends. 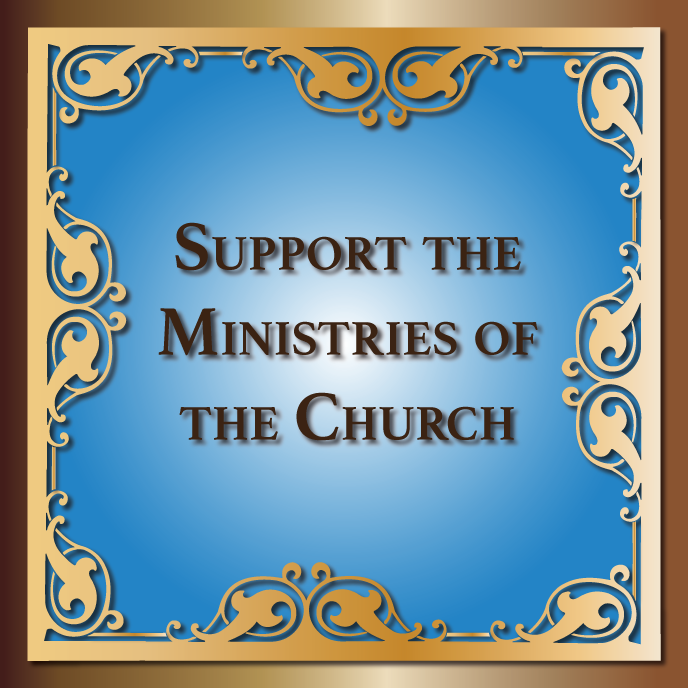 We must not stifle our clergy, forcing them to “move” the festal celebrations to Sundays so that we need not attend church more than once a week. 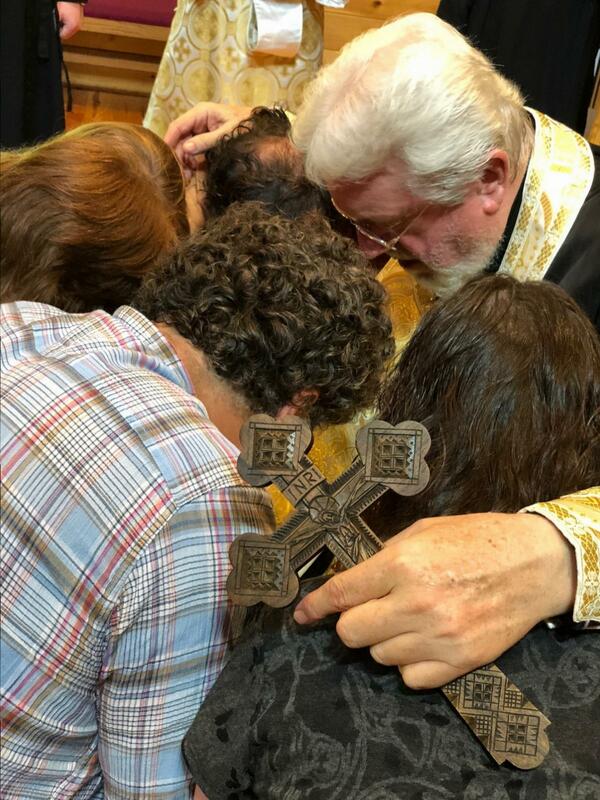 We need to free our priests from this responsibility of explaining to the Lord one day why we were not in church on Monday, Tuesday or Wednesday. 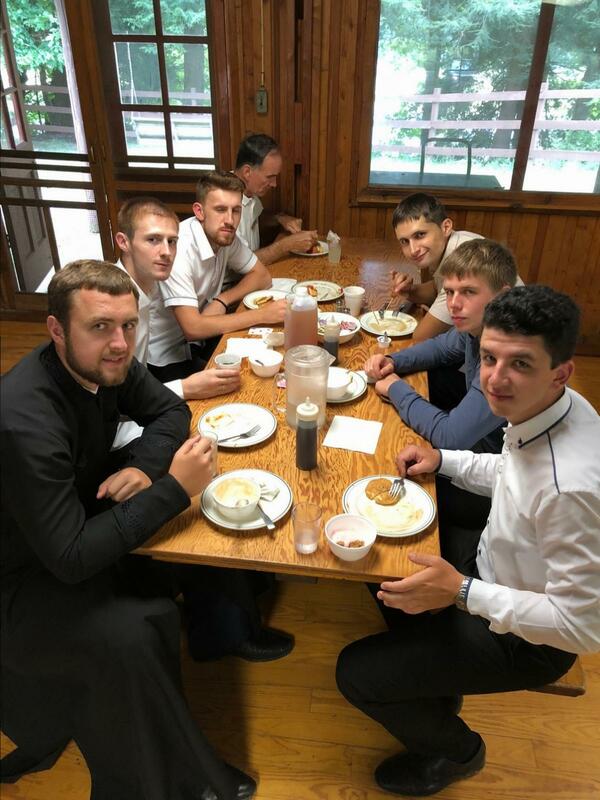 We need to allow him to serve daily, and then answer for ourselves before the Lord why we were not there, and explain what was so important that we chose not to attend the Wedding Feast. 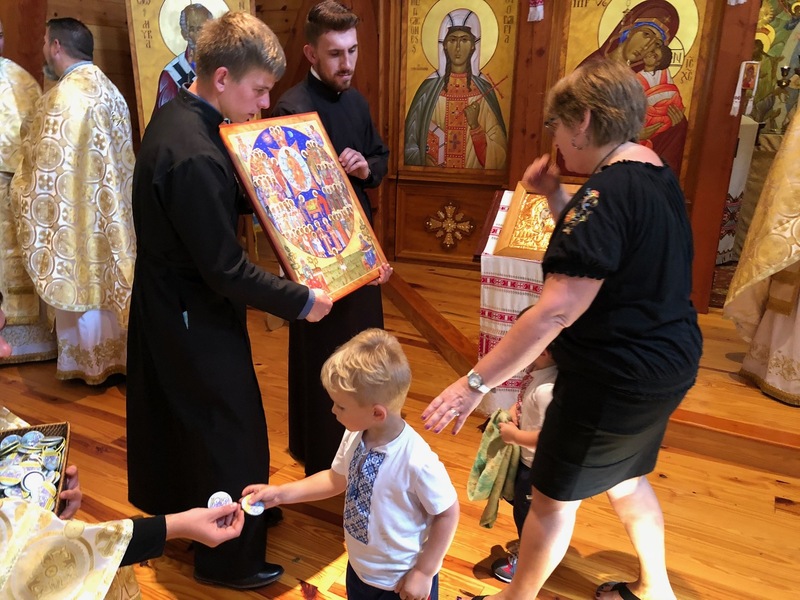 Vladyka turned to the parents and asked them whether they were guilty of not bringing their children to church because the children whined; or worse, were they guilty of holding their children back and not taking them to church, even though the child wished to go. It is more common for children to wish to go to church on Sundays, than not, and often it is the parent who is “lazy” and decides to sleep-in that day. 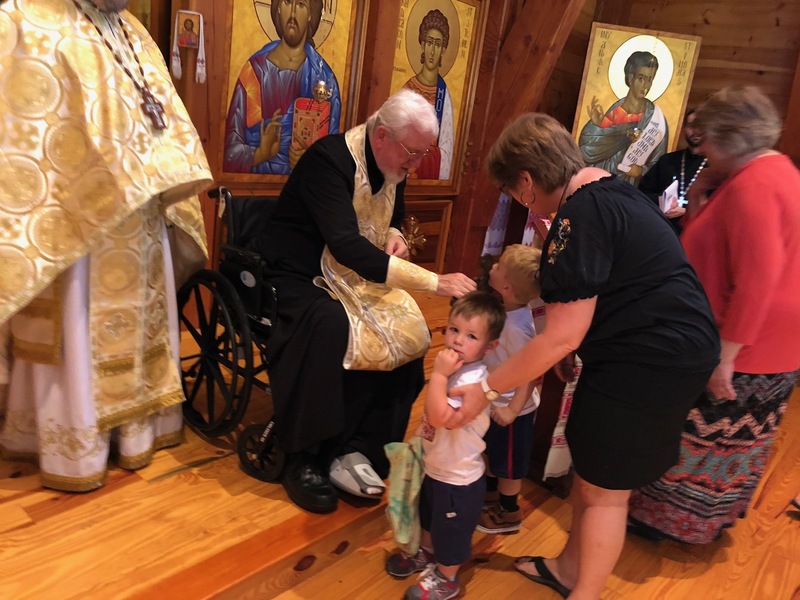 With passion in his voice, His Eminence, reiterated that we are all called to the banquet, no matter how rich or poor we are, how educated, or skilled. We need to be careful in our choices and guard ourselves against laziness of body and spirit. 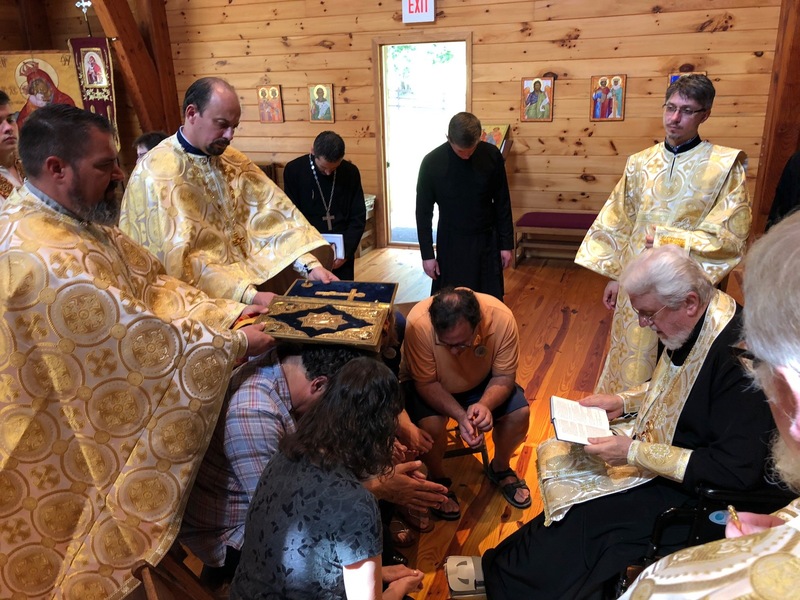 With heads bowed, minds overflowing with thoughts, eyes sparkling with tears of realization of what we as Orthodox Christians are commissioned to do, everyone solemnly moved forward as the clergy gathered to serve a short Litia in memory of all our ancestors, benefactors of our Church, of the campground, and those who sacrificed to build a strong Church family. Strangers, no longer felt like strangers, but, as they pushed forward elbows touching they no longer felt uncomfortable, but, took the opportunity to look up in to the eyes of the person next to them and smile. 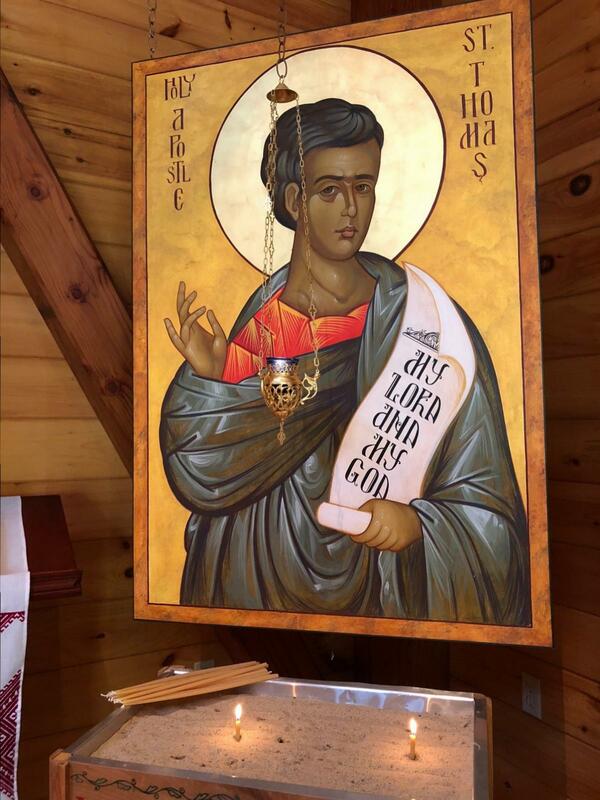 After praying that the Lord grant peaceful rest to those departed servants who had participated in the founding, building and growing of the Ukrainian Orthodox Church of the USA, His Eminence blessed an icon of “All Saints”, written by iconographer Michael Kapeluck. 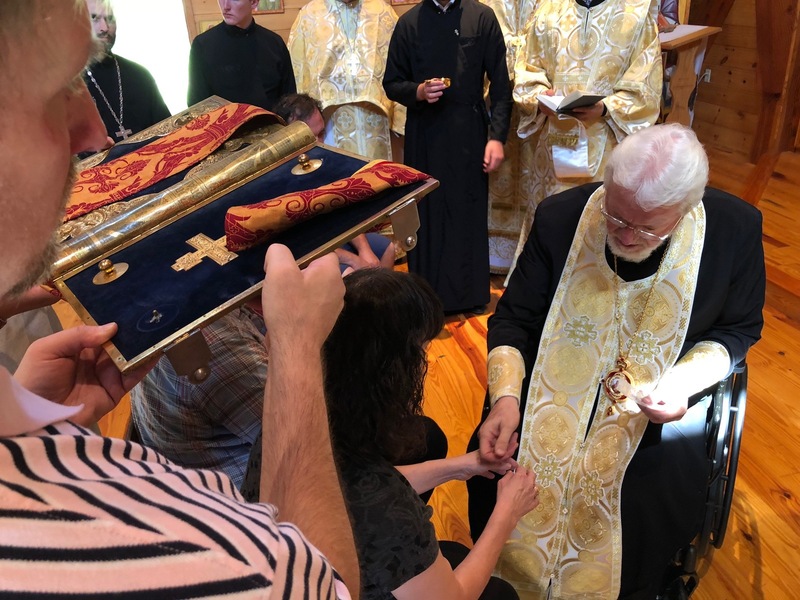 With renewed spirits everyone shuffled forward to venerate the Cross offered by His Eminence Metropolitan Antony, rejoicing at his presence, confident in his leadership. 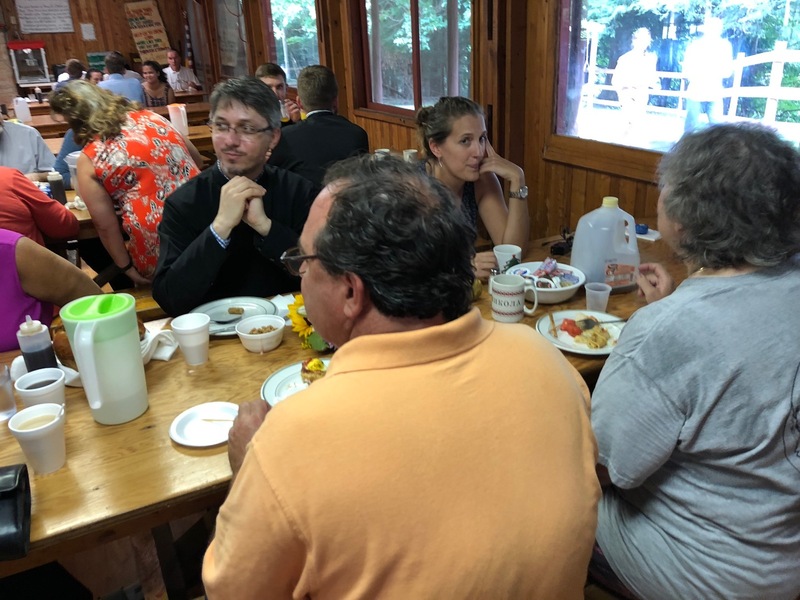 As most of the faithful drifted out the wide-open doors to break their morning fast, a few remained behind for an unction service. The now empty nave resembled an old masterpiece painting. 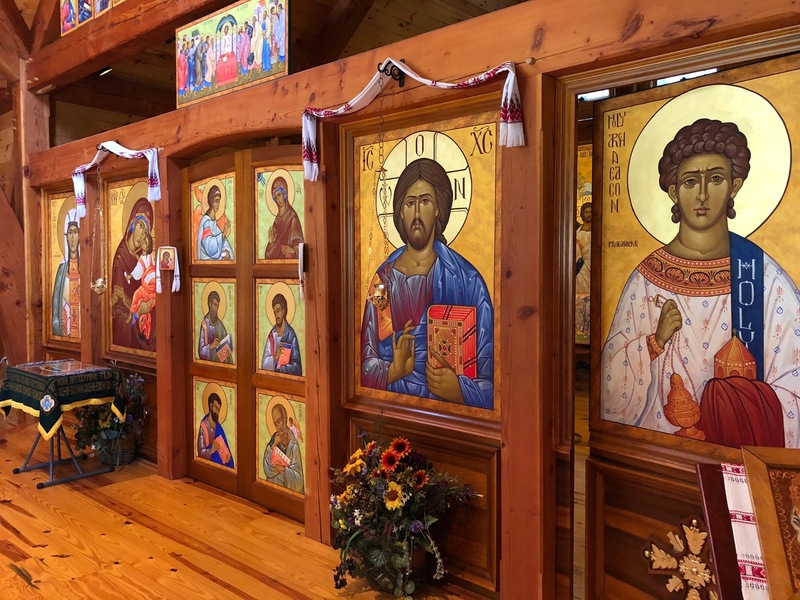 The halos of the saints in the icons glimmered peacefully in the late morning sunshine, which cast mystical rays through the incense laden atmosphere. 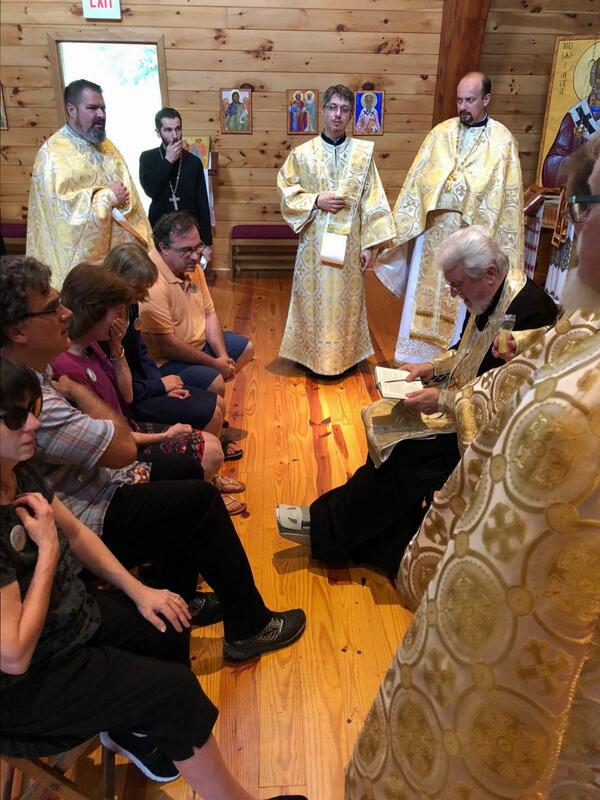 The robes of the clergy, glowed as the sunlight hit them, as they gathered around the five individuals who sat in the middle of the Nave while His Eminence prayed over them, begging for God’s intervention on their behalf, remission of sins, and healing of body and soul. 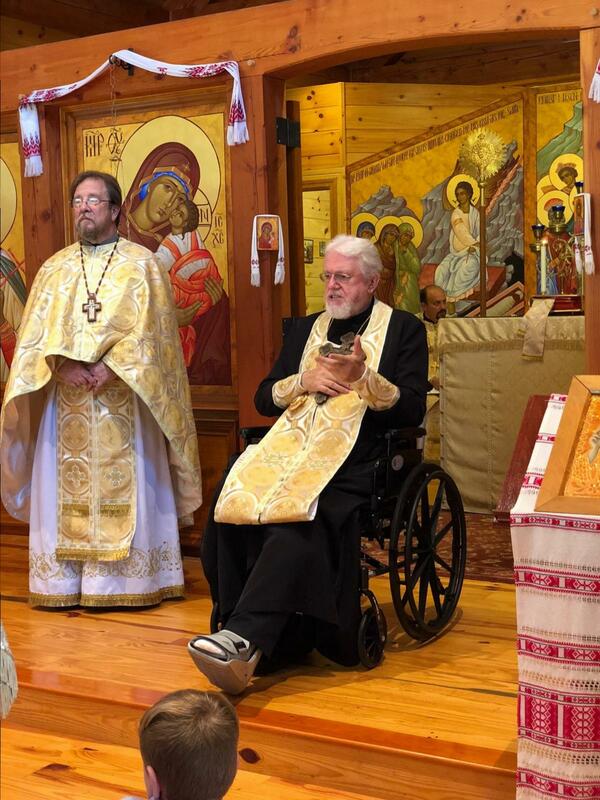 As he anointed the ill individuals with the myrrh from the miraculous icon of the Mother of God, the faithful who had remained to pray for them, also felt the presence of the divine, as the Lord reached down His healing hand to touch everyone present. Human voices raised in song, were joined by sounds of weeping as people’s spirits were moved and the tears overflowed. It was a moment that seemed as if time stood still. 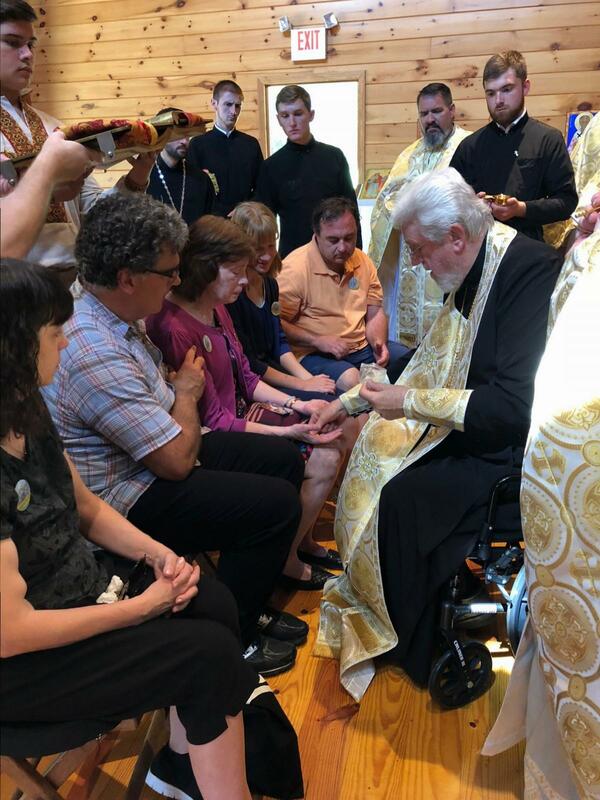 The priests, deacons and seminarians who stood and prayed alongside, almost seemed like saints and angels gathered in answer to the petition, heads bowed somberly, basked in sunlight, solemnly praying to the Lord. Quietly the service ended and without a word, people begrudgingly pulled themselves back to the physical world and slowly exited the chapel. Not wishing to part with the peace that overtook them, some individuals chose to wonder the grounds, finding quiet corners of nature in which to contemplate their recent experience before returning to the physical world. 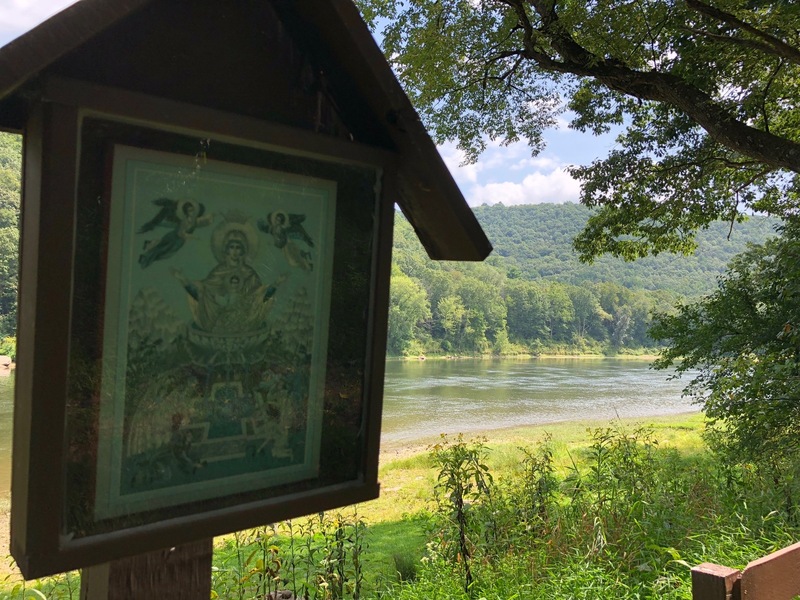 The campground has a lovely prayer trail that leads down to the Allegheny River below. It was the perfect place to simply be with the Lord. 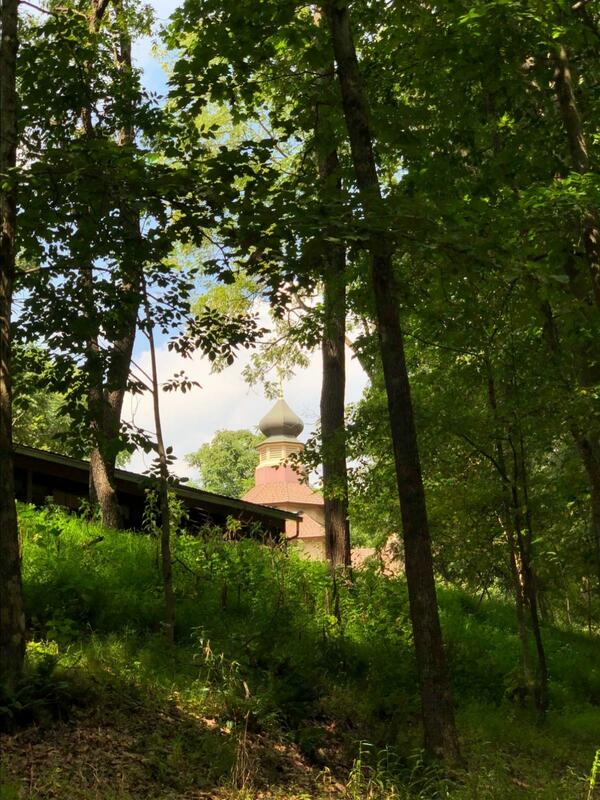 Descending along the shady and peaceful trail to the water’s edge, one could look up and see the steeple of the church glimmering through the treetops. 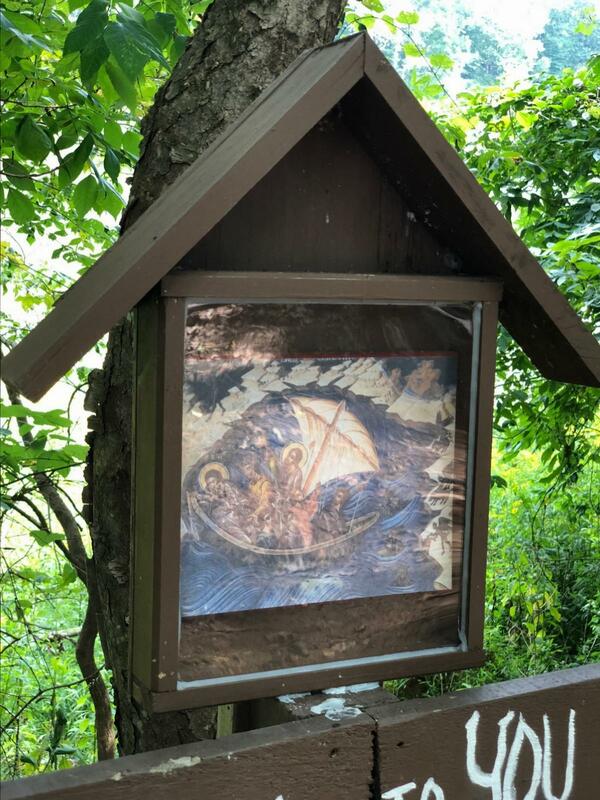 Various icons, representing nautical themes were erected along the trail – Christ stilling the storm on the Sea of Galilea, Jonah and the whale, etc. allowing opportunities to stop and whisper a quick a prayer, or sit on nearby benches to simply “be”, be alone with thoughts, be alone in prayer, be alone with God. 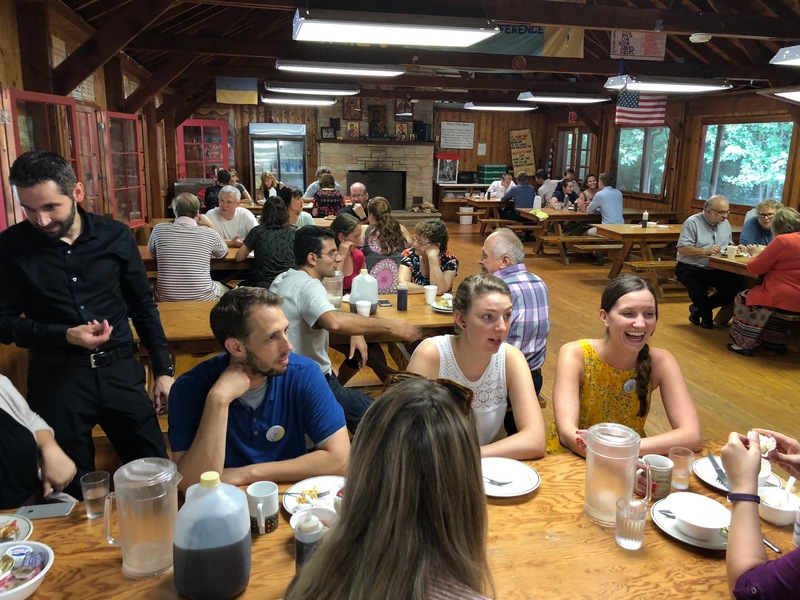 As the cicadas began to sing in the rising heat of the day, everyone found their way to the pavilion to enjoy brunch and each other’s company. New friends gathered with old acquaintances, sitting side by side, enjoying each other’s company. 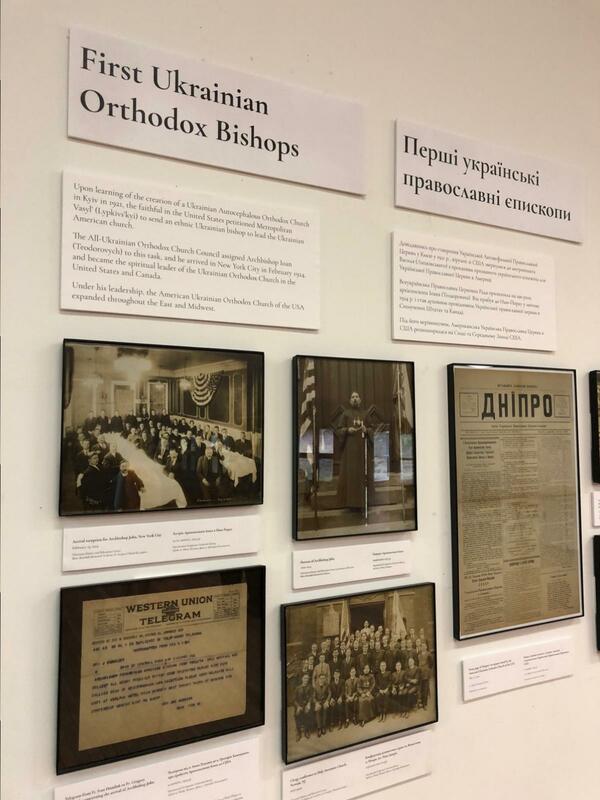 The room overflowed, as some groups got up to walk the beautiful grounds, and others poured out onto the veranda to continue socializing, while yet others moved up the hill to the Millennium Center where there was an exhibit from the Ukrainian Museum – “Ukrainian Orthodoxy in the New Land: 100 Years in the United States of America”. Natalia Honcharenko, Museum Director, gave a short explanation and tour of the exhibit, thanking her husband Michael Andrec, our Church Archivist, who along with Dobrodijka Oksana Pasakas our Seminary Librarian and Collections Manager of the Ukrainian History and Education Center, for their hard work and assistance in preparing the materials for the exhibit. 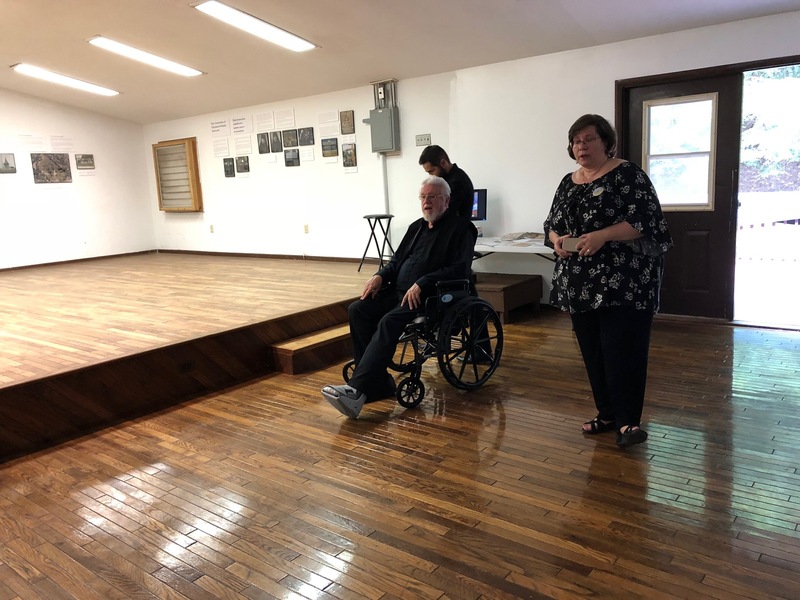 Slowly people made their way past the various displayed items, stopping to read historic passages, look at old black and white photos, and marvel at how much truly has been accomplished in the last one hundred years in the Church. 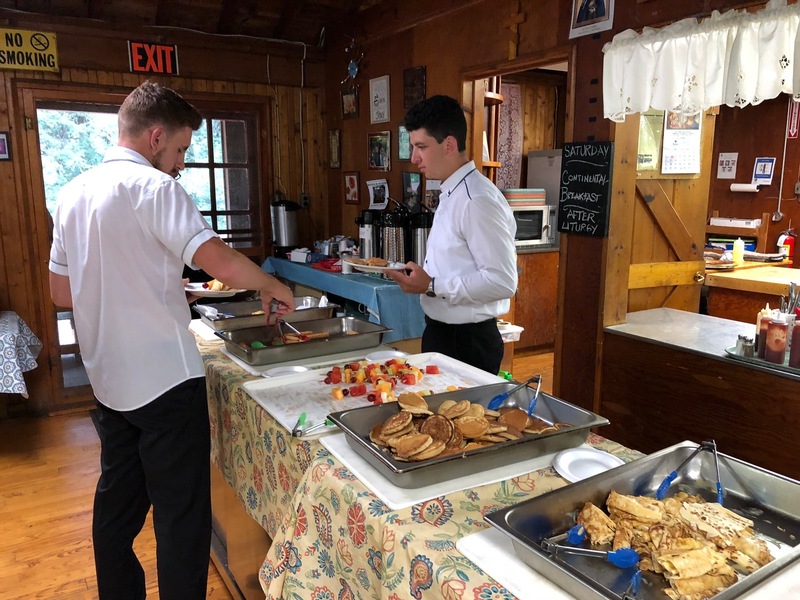 Slowly, some guests began to depart, while many remained behind to enjoy the “Family Fest” throughout the Labor Day weekend. Cars began to drive off, passengers waving their hands, sticking their heads out open windows to bid farewell to everyone, even people they did not know; while those remaining behind looked up and with smiles on their faces waved back. As the sun began to descend, the campground quieted down. Nonetheless, His Eminence Metropolitan Antony’s words still rang in everyone’s ears, minds and souls. 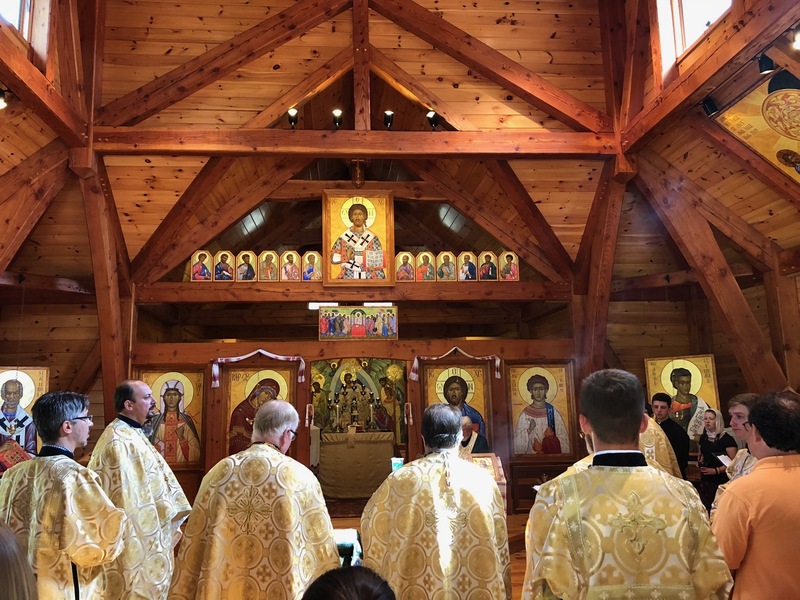 Rejoicing in the celebration, yet, contemplating what each should do to ensure the continued success of not only the UOCofUSA, but, of their local parishes, the Orthodox Church, and in truth of all of God’s Creation. People realized, some for the first time, that we are not here to merely enjoy ourselves. We are here to make a positive difference, and to shine the Light of Christ, which He has passed on to us, in the darkening world around us.